Thanks to auto-routing feature connectors flow around objects. And what if you want to want some background objects that the connectors flow through? No problem! ConceptDraw Arrows10 Connectors are enough smart to recognize this situation flow properly through a background object without any additional efforts from your side. Sample 1. 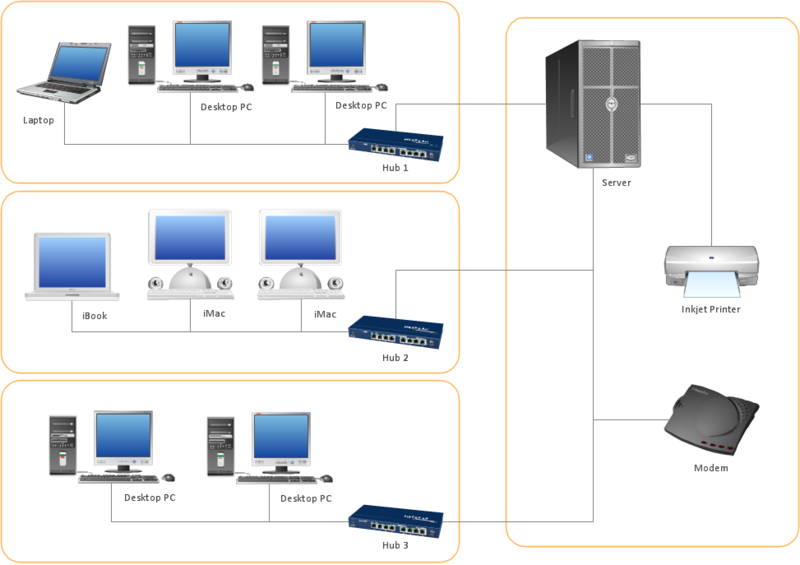 Simple LAN diagram. You want to connecting objects manually? You don't know how should diagramming software work? Is it possible to develop a diagram as quickly as the ideas come to you? Yes. The innovative ConceptDraw Arrows10 Technology - This is more than enough versatility to draw any type of diagram with any degree of complexity. You can start draw your diagram manually now. The Idea Communication Solution helps to brainstorm new idea, draw new idea mind map, outline new idea, show new idea at the presentation, and report new idea at the meeting.